In the past few years, automotive technology has evolved significantly within the dashboard thanks to computer giant, Nvidia. Although Nvidia is new to car technology, they introduced the Tegra processor into car infotainment systems, making them the smartest dashboards on the road. Nvidia is known for their impressive, high-powered computer chips and graphics cards. Recently they have been creating mobile chips for cell phones and now Nvidia technology has reached your car’s dashboard. Powering these chips are the Tegra processors, which consume less power and provide higher performance. These processors allow your infotainment system to run smoother and more quickly, meaning more convenience and less frustration. The Audi navigation system (known as the best infotainment system) utilizies the Tegra 3 processor and includes a clear, 3D view of maps using Google Earth. Other than superior GPS capabilities, the Tegra processor provides crystal-clear voice recognition – reducing driver distraction. Nvidia is also attempting to digitize everything on the dashboard, including gauges and dials. This year at CES, Nvidia and Audi announced Tegra 3 processors will be in Audi automobiles, finally making it to the United States after spending most of their time in Europe with the Tegra 2 processor. This expansion will reach Canadian and Asian markets as well. If you enjoy video games and racing, may I suggest Forza Horizon for the Xbox 360. If racing on the open Colorado roads with the fastest cars out there is what you are desire, this is the game for you. The energetic, upbeat soundtrack with high-performance graphics will fuel the adrenaline rush you are seeking in a game. From the ’66 Ford GT40 to the 2013 Dodge Viper, this game has all the muscle you can ask for. And if American cars aren’t your style, don’t worry – you can drive the ’62 Ferrari 250 GTO, or even the 2012 Bugatti Veyron. This game will keep your heart racing. Don’t own an Xbox 360? No worries – Playstation 3 has you covered with Gran Turismo 5. Although GT5 is over two years old, it is still the most versatile, realistic racing game on the market. It includes hundreds of customizations for your automobile, including suspension, brake pads, exhausts, and my favorite – transmission. Like most racing games, you can choose either manual or automatic transmission, but in Gran Turismo you can customize the transmission to your liking. For example, if you increase your engine to 650hp, but still aren’t going as fast as you would like, you can change your gear ratios. This will increase your speed, allowing the full-throttle carnage you want to release onto your opponents. Another unique feature in Gran Turismo 5 allows players to sell their cars online for in-game credits, or even trade to other players. Cars are constantly moving over the Playstation Network. GT5 not only has unique cars, but updates are always being released. 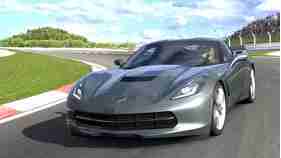 Players now have the opportunity to drive the all-new 2014 Corvette Stingray after downloading it from the Playstation Store. Gran Turismo 5 also includes the GT Academy, where players have the chance to compete in competitions around the world to become an actual racecar driver. In 2012, four Academy champions were chosen to race in the 2013 Dubai 24-hour race. So if you aren’t a racer in the real world, Gran Turismo 5 will give you the opportunity to become one. In 2013, we should expect more cars to contain Tegra 3 processors, digital dashboards, and accurate navigation systems. Infotainment systems will also be smarter and more responsive. Racing games are becoming more realistic and giving players the chance to compete for real-life prizes. This year will introduce even more innovative technology.